A popular 19th century apple, very widely grown in Europe at the time, and versatile for culinary and dessert uses. 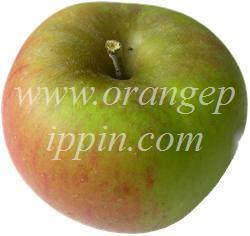 King of the Pippins is a sharp, firm, juicy apple which sweetens in storage. 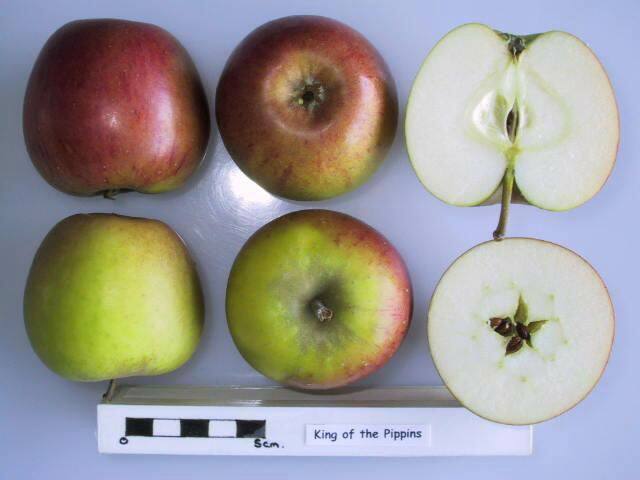 If this variety were discovered today it would hardly merit the title "King" of the pippins, or even "Reine" de Reinettes" (queen of the reinettes) as it is called in France. However back in the late 18th century when it first became known the name was probably more appropriate. We moved into a Victorian house 20 years which had an old King of the Pippins in the garden. We've loved the sweet tartness of these wonderful apples which keep until April or May in our cool garage. Reine de Reinettes ranks among the top five apples I have tasted: fine grained texture, very complex flavors. Stunner. It ripens in October in Northern New England and may be different from King of the Pippins, which looks and tastes similar but ripens in September here. My wife had the great idea to bake a tarte Tatin today. I had a look at what the best apple would be to use for that. I read on wikipedia that is originally was made with two apple varieties: Reine des Reinettes and Calville. I have both in my garden, and we used the Reine des Reinettes. The result was top! Really delicious. The taste is really good, while the apple pieces keep their shape. As mentioned by others, it is a really easy tree to grow as well, and it is very productive. It's a lovely apple tree to grow in your garden. Off the tree the fruit is nicer than all the new apples off the shelves! Greta for cooking too! Linda, if you are in South Carolina there are answers to your prayers in the adjoining state. Ron and Suzanne Joyner have an orchard at Big Horse Creek Farm, in Ashe County NC. They have this variety there, I know, and graft trees to order. They are really helpful and friendly, true apple lovers with a wonderful wide knowledge. They will help you for sure. I have a 6 year old cordon and I would recommend this apple very productive each year (you have to thin out alot as a cordon) medium large, very clean fruit with a good taste(medium sweet with acid tinge - but not really King of anything) and pleasing crunch, try to ripen as long on tree gets a yellow hint to the green? This apple tree has been in our garden for about 60 years or more. We get a good crop every two years. The flavour is superb and we love it for its juicy taste. It spoils us for other apples!